A gripping, revealing account of the week before Jesus' resurrection. Perfect for giving away. Most diaries are boring. This one isn't. Easter Uncut takes readers to one man's account of a week of his life: a week of great plans, shattered dreams, nightmare scenes and renewed hope. It's what we call Easter, without any of the fluffy bits. This accessible, faithful book will engage, inform and excite non-Christians by taking them to the uncut Easter story, and to the wonder of the message of the cross and empty tomb. Yes, but… isn't this all made up? Yes, but… surely Jesus didn't really rise? Historical, engaging, and clear, Easter Uncut blows a fresh wind through our understanding of Easter. Whoever you are, you will see some new things. And whoever you are, you'll find it hard to remain apathetic about what happened. I really liked this book. It is accessible, witty, personal and fresh. Ideal to give away to anyone wanting to know the true meaning of Easter, and illuminates details believers may have missed. I heartily recommend it! This book will help those you know who don't believe in Jesus understand what Christians believe, and prompt them to reconsider and rethink what they believe. If Jesus was really who he said he was, no one can afford to ignore him. Give someone this book, and they won't want to ignore him. "I found myself buzzing at Jesus' character"
Easter Uncut is a simple, clear and effective way to put the events of the first Easter into peoples hands in order that they might consider Jesus for themselves. Set out like a diary/journal, the book retells the biblical account of the Easter events (with text straight from the Bible in bold, and helpful cues or context added in normal text) and provides a basic commentary and explaination of their significance for us. 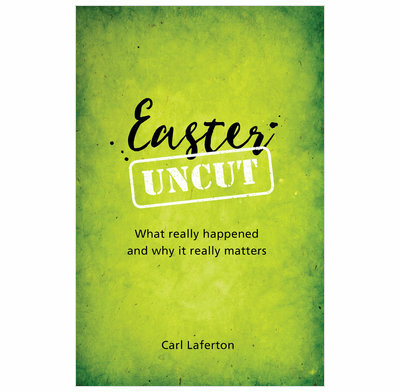 Easter Uncut is ideal as an Easter give-away book or something to offer people who have never considered Easter for themselves. For some, it may be too simplistic but for most people who will pick up or be given a copy of this book, it will be a good primer for helping people to take Jesus seriously, starting with the central week in all of human history.